The global medical device market continues to grow and becomes the most prominent field of the biotechnology industry. SynCore Biotechnology understands the importance of early diagnosis in eye diseases and established the Department of Diagnostic Device in 2013, to devote in the business of ophthalmology devices. In November 2016, SynCore signed a contract with Swiss optical instruments company Y-Ybar for the global technical development of the next generation choroidal blood flowmetry. 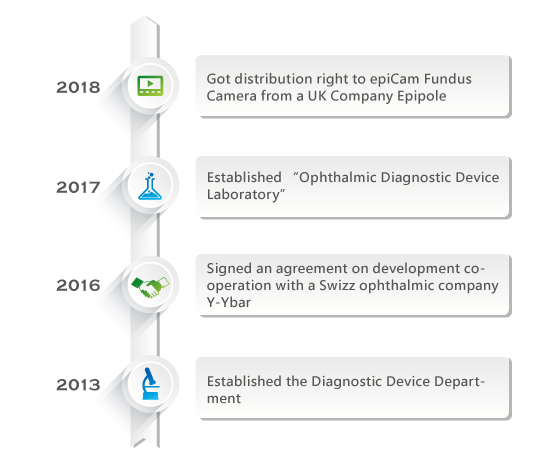 In 2018, SynCore acquired the Taiwanese distribution rights of a hand-held fundus cameras epiCam® from British Company Epipole. The design of epiCam® allows doctors to examine the fundus of infants and bedridden patients, while the camera records the progress of ophthalmology diseases.